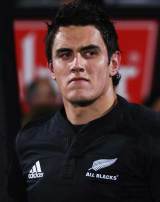 Isaac Ross followed in the footsteps of his father Jock when he pulled on an All Black jersey for the first time in 2009. In as cover for the injured Ali Williams, Ross impressed with an athletic performance in an otherwise sloppy loss to France in Dunedin. Despite fears that Ross neglected the grittier aspects of lock play, continuing injury to Williams ensured that he began the Tri-Nations in the All Black second-row. He won his fourth cap against Australia in the opening game of the series, helping his side to a 22-16 win. At domestic level Ross represents Canterbury, and has played for both the Highlanders and Crusaders at Super 14 level since his debut in 2007. Following the conclusion of the Tri-Nations in 2009 Ross was omitted from the All Blacks' November tour squad, being told to bulk up in order to reclaim his place. He failed to do so following the 2010 Super 14, and returned to the Canterbury ranks as the All Blacks romped away with the Tri-Nations.